SAN ARDO, Calif.— Crude from Monterey County's biggest oilfield is more climate damaging than any other large source of oil produced in, or imported into, California, according to a new Center for Biological Diversity analysis of state data. The Center’s report, titled Stealing California's Future, found that crude from the San Ardo oilfield is even more carbon-intensive than notoriously dirty oil from the Alberta tar sands in Canada. Today's report also found that the San Ardo field is the most carbon-intensive large oilfield in California, ultimately generating about 3.3 million metric tons of greenhouse gas pollution a year — equivalent to driving a car 8 billion miles. Carbon intensity is one measure of the planet-warming pollution associated with crude production, from the well to the refinery. Yet the Center's report notes that state and federal regulators are poised to lay the groundwork for an expansion of the San Ardo field. With more than 1,000 active wells, San Ardo already produces more than 7.6 million barrels of oil a year — almost 4 percent of the state's annual production. The oil industry is currently pursuing “aquifer exemptions” from the federal Safe Drinking Water Act that would allow companies to continue to dump oil-waste fluid into groundwater around San Ardo. If approved by the U.S. Environmental Protection Agency, these exemptions would pave the way for expanded drilling and oil production. San Ardo’s heavy crude is so thick that oil companies typically use extreme extraction techniques like cyclic steaming — which require enormous amounts of water and energy — to extract it. In 2015 oil companies used almost 2 billion gallons of water in cyclic-steam and steam-flood operations at San Ardo. The energy required to heat that vast volume of water is one key reason why this oilfield is so bad for the climate. * Carbon intensities in gCO2e/MJ; volumes in barrels per year. Source: Air Resources Board. 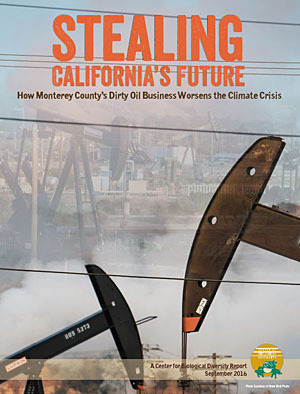 Download Stealing California's Future: How Monterey County's Dirty Oil Business Worsens the Climate Crisis.